We offer a range of scholarship opportunities for international undergraduates which you may be eligible to receive or apply for. Please note that scholarships are only available to self-funding students. Students are only eligible to receive ONE bursary - whichever is greater. 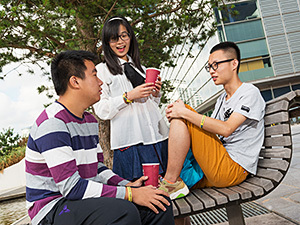 Every year we provide a number of scholarships recognising the talents of our international students, which will be applied towards the cost of your tuition fees. All non-EU international students enrolling on an undergraduate course in September 2018 will be eligible for a scholarship of up to £2,000. This is awarded based on your academic background. Status: Open – scholarship offer will be made when we make you a course offer. Please note that scholarships are only available to self-funding students and those studying on a full time course for at least one academic year. To welcome all new EU undergraduate degree students starting in 2018, we're giving away at least £150 worth of credit to spend in a host of ways, on books and a range of learning materials. Even better, it doesn't have to be repaid. If you pay your tuition fees in full before travelling to, or during your enrolment in the UK, you will be entitled to a £300 prompt payment discount. This discount applies to the amount you owe after any scholarships or bursaries have been deducted from your tuition fee.